Jundado is a product design label from Düsseldorf, Germany. Our products are plain and reduced, but always with a tender wink. All products are made in carefully chosen factories and workshops in Germany and have received several design awards. Everyone loves a good story, and some of the most memorable stories are the ones we read, or were read to us, when we were children. The bedtime story is a tradition in many families around the world, but while reading we also hope those little ones will fall asleep, so we can’t have bright lights on that will keep them awake. But it isn’t easy reading a book in low light, and children’s books, with their colourful illustrations mixed in with the text are especially difficult to read without sufficient light. This was the problem Claudia Hüskes faced every evening when trying to read bedtime stories to her two young children. Already a successful entrepreneur, product designer and recipient of two Red Dot Design Awards, Claudia decided to apply her skills to solve the problem. Reading lamps that focus light on the page of a book are not a new idea, but most either create mood lighting, need holding, or are just boring to look at. Claudia wanted to design something fun, bright and with plenty of light. After many late nights at the drawing board in the office of her design company, Jundado GmbH in Düsseldorf, Germany, the concept started to come together. In 2013 the first prototype of Henry was presented to the world at an exhibition in Cologne. Claudia held her breath as she waited for the reaction to her new baby. But she needn’t have worried; Henry was an instant success and has even gone on to receive the 2017 Non Book Award at the Frankfurt Book Fair. 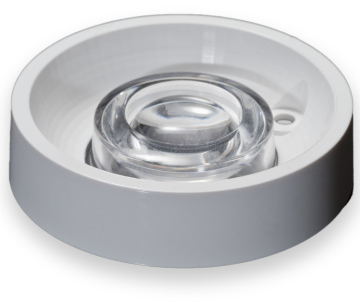 Henry has a soft body with a bright light from 7 LEDs all focused by a LEDiL SAGA-HB-IP lens (without holder) to provide light at two different levels of brightness. Claudia chose SAGA-HB-IP as it is a soft and safe lens that fits the design perfectly. Henry’s light lasts for up to 8 hours and can be fully recharged using the USB connector in his belt pouch. Henry can rest on your shoulder to provide light while reading in bed, and he can be locked using the inbuilt key function so the light doesn’t turn on accidentally while Henry is travelling in a backpack for example. Go Henry!